Professional full-time artist specializing in painting wargaming miniatures. All scales and periods catered for - 6mm, 15mm, 28mm Available for commissions from a single model to a complete army! Also battle reports, projects, reviews and general gaming news. * ITEMS FOR SALE - as well as painting models, I also sell pre-painted models and assorted loose models and scenery on Etsy and Ebay. Links here! As a first time trader at the Battleground Show, I thought some of you may like to know how it went, my feelings on the day, and the results of a days trading. It's a sports hall on a College campus. The hall was great and clearly maintained to a high standard. The lighting was great, open and bright, and importantly the hall was warm! There was also plenty of room to move between stalls and games. I decided to make my day of trading based on two principles. Firstly, that nothing on my stall that I was selling would be cheaper to buy online, and secondly that I would be open to barter on every item. I feel this is what shows are about - people want bargains, great deals, and to handle the models in person. Everything you cant get from online sales. It didn't seem much point to me to sell at the same prices as online and only offer a saving of postage costs. Thankfully I got situated between two great veteran traders who warmly welcomed a new guy. Big thanks to 'Templar Wargames Scenery' (https://www.templarwargames.co.uk/) and 'Grahams Wuerkshoppe' (https://www.facebook.com/grahamswuerkshoppe.co.uk/). And I totally forgive the random dude who came over to my stall and accidentally spilt his cup of tea all over my business cards! Not quite the start to the day I was hoping for, but it was a laugh for sure! I didn't really know what to expect here. Would I sell much? Would I sell anything? Thankfully the day went really well. On my stall I offered a wide mix of random miniatures and random deals. I had 'Buy One for £8 or Buy Two for £15', 'Any X for £X', and one lot clearly marked 'Or Nearest Offer'. Most people went for the Two for's... or the X for's... and on multiple purchases I rounded-down on the odd few pence rather than root through for change. I think this helped speed up sales and visits to my stand a lot. Rather than have people wait around and count coins, it was a straight case of exchanging notes. This had the added benefit of there being usually good space around my table, with nobody really needing to look over each others shoulders and wait for folks to move on. Tech! I totally failed to consider how sales have moved with the times. I was aware of the usual 'card readers' for card payments, but more than once I was asked if I accepted Paypal, with payments made by mobile (cell) phone! The purchases I made at a couple of fellow traders stalls. One in particular was for £20.35. An odd number which given the atmosphere of a trade show I expected to be round off to £20, as £20.35 would be the same price I would have paid online. Perhaps it was a little cheeky of me to expect the change to be discounted, but it got me thinking about time and effort. Here as a consumer I made the time and effort to come to the show, to patronise the event and the stall. I also saved the trader the time and effort of having to wrap and post the item. And this spirit was not worth 0.35p? Whatever happened to barter, bargaining, offers and counter offers? Despite a lot of models on my stall being bagged as loose minis, and one lot clearly marked as taking offers, I only had one guy the entire day barter and knock me down from an £18 marked item to a sale at £15. 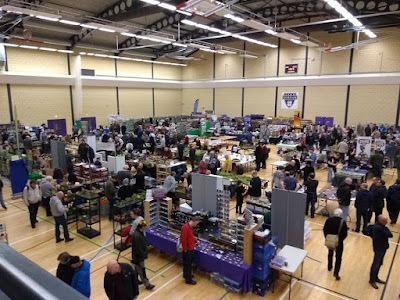 It was a great day, in a fantastic clean, airy and bright venue, with plenty of space to move and dozens of games to watch and play. Sales were good (for myself at least) but I did hear a little mutter from other traders over their takings for the day and I couldn't help but think maybe it was due in part that they were not offering much beyond the same as they offered online? I also saw that the number of people attending was well over the 600 mark. Attendance is great, but at the end of the day it is sales that drive events. If you are making the effort to attend, and enjoying the experience, days like Battleground will only grow if the traders are happy, and the traders are only happy if the sales are good. Maybe effort is needed by both parties? I know I need to improve - I need to accept PAYPAL! and I was tied to my game all day and didn't get the chance to come over and say hello!